High school students are at risk of becoming addicted to nicotine, a fact confirmed by a North Carolina Department of Health and Human Services analysis of vaping devices confiscated from students at seven schools in various parts of the state. Nicotine — the addictive drug found in cigarettes — was present in 85 percent of e-cigarette and vaping devices and containers analyzed by the department’s State Laboratory of Public Health found. However, youth are not always aware that e-cigarettes and vaping devices contain nicotine. A U.S. Monitoring the Future Study (2018) found that 11.5 percent of 8th–12th graders perceive they are “only vaping flavors” with no nicotine, and this percent increases with age. A Truth Initiative Study (2018) found that 63 percent of Juul users (age 15-24) did not know these products always contained nicotine. For the last four years, e-cigarettes have been the most frequently used tobacco products among students in North Carolina. From 2011 to 2017, e-cigarette use by high school students increased nearly 900 percent with 16.9 percent reporting e-cigarette use in 2017. Among middle school students, e-cigarette use increased by over 400 percent from 2011 to 2017. Use of e-cigarettes by students while in school poses health and safety risks and violates established tobacco-free school policies in North Carolina. 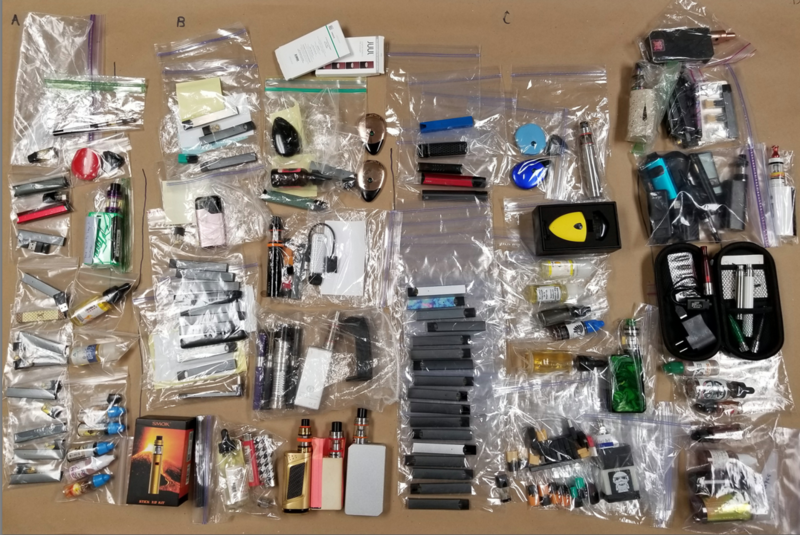 Conducted by the State Laboratory of Public Health in partnership with the Division of Public Health’s Tobacco Prevention and Control Branch and the NC Department of Public Instruction, the study found that of the 76 devices confiscated by schools, 33 (43 percent) were Juuls. Commercially sold Juul pods sold at that time are equal to about two packs of cigarettes. Products like Juul resemble flash media drives used for storing and sharing files on computers. Due to increasing use by youth, North Carolina Attorney General Josh Stein launched an investigation into Juul marketing practices last year. Additionally, most e-liquids tested were flavored. The Food and Drug Administration and U.S. Surgeon General Jerome Adams have voiced concern that candy-flavored vaping products are particularly enticing to middle school and high school students. While the FDA has authority over these products, according to the current FDA time-line, the products themselves would not begin to become fully regulated until August 2022. QuitlineNC is North Carolina’s tobacco cessation program, which can help people quit e-cigarettes as well as other tobacco products. For free help to quit, call 1-800-QuitNow (1-800-784-8669) 24 hours a day, seven days a week. The e-cigarettes collected from the seven schools studied – prior to testing.